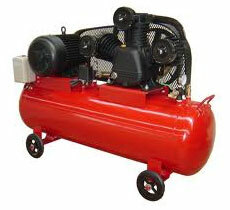 Compressed air is a vital utility to most commercial and industrial operations. It runs essential tools and machinery, provides power to material-handling systems, and clean air to processes. Yet choosing the right compressor for many applications can be difficult, especially given new technological developments, added concerns about even and steady pressure, maintenance, and that traditional nemesis, electrical power. If you think consistent air pressure doesn't matter much, consider the experience of one manufacturer of precision automotive drive line systems. They assemble finished products using pneumatic torque wrenches attached to a fixed-drive air system. Varying air pressures changed the torque values of the wrenches so much that it affected proper sealing. Until they changed over to a frequency converter system, they were forced to reroute their finished products back through a separate line to retorque them. They didn't ship anything that was not fastened with the correct torque values. The cost and dependability of compressed air can have a tremendous impact on production processes. Surprisingly, compressed air costs are most often considered only in terms of equipment. Yet energy consumption represents up to 70% of the total cost of producing compressed air. So with energy costs escalating nationwide, an energy-efficient air system deserves more consideration. Other significant factors to consider include reliability, productivity, systems support, automated features, and noise. One of the main causes of increased costs is a mismatch of compressor capacity to a fluctuating air demand. Most compressor packages use three-phase asynchronous drive motors. The permissible switching frequency, or ability to switch start/stop modes, drops off the higher the rating. But lower frequency does not correspond with the frequency needed to efficiently switch compressors on or off as dictated by narrower on-off switching differentials resulting from actual air demand. So the compressors are run off load (idled). This is accomplished by unloading the pressurized end of the compressor and letting the motor run for the off-load period. But it's not as efficient as it sounds because the power consumption of a compressor running off-load is still 20% of that needed for full load. That's wasted energy and must be regarded as a loss. On the compressor side, the selection is ultimately based on a study of appropriate available technologies, as well as evaluation of existing equipment. In some instances, such as a continuous demand at full load, a fixed-speed rotary screw compressor may be the best solution. In cases where the base load varies with an additional load, it might be best to consider supporting the base load with fixed-flow compressors and adding a unit with a frequency converter to carry the load variation. The efficiency of variable-speed compressors controlled by a frequency converter is not constant over the complete control range. Between 70 and 30% of full flow, or speed, efficiency is reduced from 94 to 86% for a 94-kW motor, for example. Added to this are losses in the frequency converter and the nonlinear performance characteristic of the compressors. If variable-speed compressors are wrongly used, they can turn into secret power eaters. This means a frequency converter is not a universal remedy in the search for maximum efficiency and power-saving compressor operation. A better system may include a rotary screw compressor with a frequency converter. Many commercial and industrial compressed-air users find such a setup improves air-system energy efficiency, reduces maintenance costs, and reduces noise. Since many applications have an inconsistent demand for air, a frequency converter system can meet the changing demand "on the fly," and offer other cost and quality benefits, depending on system design and use. Rotary-screw compressors with fixed speed drives are limited in the number of times they can be stopped and started in a given period. In applications with a variable compressed-air demand, frequency inverters may run idle for long periods to avoid the overheating caused by frequent restarts. Although a fixed-speed compressor does not produce compressed air while at idle, with modulation control it still consumes about 70% of full load electrical power, which translates into substantial electrical costs without benefit. On the other hand, a fixed speed compressor operating under dual control (stop/start or on-line/off-line mode) uses only 20% of full load electrical power. However, compressors equipped with frequency converters are better able to match their variable demand requirements, almost eliminating the need for compressor motors to "rest" in an energy-consuming idle mode. Electric motors equipped with frequency converters have been around for some time. Traditional frequency converter applications include fluid pumps, HVAC, conveyor systems, and positive-displacement rotary-lobe blowers. Only recently have they been applied to rotary-screw air compressors. Frequency control rotary screw compressors, typically saves users 20 to 35% on electricity when applied to variable loads. An inherent advantage of frequency converter equipped compressors is the ability to start and stop the compressor as often as needed. Unlike fixed-drive systems, frequency converter systems are soft starting, and have the lowest inrush current requirement. This allows unlimited starts and stops of the motor. For example, a 100-hp fixed-drive system is limited to two or three starts and stops per hour because the inrush current required to start it would heat up the motor windings. The motor has to run for 20 min to cool the windings before it can be turned off and then back on. What's more, the user may be penalized by the power company for even one spike on the demand chart from high inrush motor starts. A factor often overlooked when evaluating plant air systems is noise. It's partially due to compressor speed, but also the packaging of the equipment. A standard compressor with a frequency converter has a lot of audible electrical noise. It makes a high-pitched "chirping" sound in the motor. But the sound is practically eliminated thanks to large motors, large air ends, low speeds, radial fans, and enclosed packaging. Some systems blow air through an oil cooler and out, resulting in high noise levels. But an integrated system ingests the cooling air, diverting it upward away from people, reducing apparent noise considerably. Some manufacturers retrofit frequency converters to existing compressors, rather than purchasing a system that combines the best of both designs. In many cases, this is inadequate. Rotary-screw compressor efficiency is based in part on operating the air end within its optimum speed range, which can be plotted on a bell curve. In an efficient range there is a flat top to the bell curve, but on the edge it falls off rapidly. In other words, too slow or too fast uses more electricity and produces less air. Simply adding a frequency converter onto an existing compressor design often does not work because the compressor design may be in the middle of the bell curve, or on the edge of the bell curve. Plus, in a retrofit scenario, the existing motor may not be designed to handle the conversion from fixed-speed to variable speed. Also, proper cooling of the motor during low-speed operations needs to be considered. It's necessary to design the compressor air end to operate in the top of the bell curve along with the whole speed range to maintain maximum efficiency in terms of kilowatts in and compressed air out. Compressors with large air ends produce a much flatter curve. The torque required by the air end determines the frequency inverter size. A small air end with higher speeds can use a smaller, less-expensive frequency inverter. But the efficiency and operating range of a big air end and higher torque requires a bigger frequency inverter. A low-speed operating range, from 1,800 rpm down to 450 rpm, produces optimum performance. Slower speeds lose efficiency, and faster speeds require a larger frequency inverter. Another drawback to retrofitting a compressor with a frequency converter is the danger of harmonics backing into the plant electrical system. These could disrupt or even destroy other plant equipment. However, with a completely integrated system all feedback should be isolated or eliminated so no harmonic distortion goes into the plant's electrical grid.